When we talk about the validation of software, we may be considering software as a component part of a product, or software as a standalone product itself, or the software can be controlling a manufacturing process, or may be used as an electronic record. For each of the above applications of software, and for all others, we need to consider the criticality of the software in place. If an error arises within the software, or between the software and its interfaces, what is the potential risk to the organizational stakeholders who are users of the software either directly via using the software itself, or indirectly, via using a product or process which is an output of the software? The greater the risks associated with software errors, then the greater the need to ensure that the software will operate exactly as required. 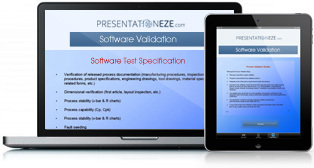 Software Validation is the process of verifying that software confirms to design requirements, is reliable, will repeatedly perform as required, is user friendly and incorporates the necessary safeguards comparable to the risks associated with its use. When considering software validation, we need to ensure, that the burden placed on an organization, is related to the risk associated with the software. For software with potentially low risk impacts, then validation may not be necessary. If the potential risk is high, then significant validation may be required. Risks can be related to human health, financial, reputation, regulatory compliance. Therefore, before integrating or implementing any form of software into a product, process or business, the potential risks need to be considered, then when the risks are quantified, the extent of software validation can be determined. For effective software validation, we need to consider aspects such a defining the user requirements specifications, the hardware and software design specifications, the test specifications. What will be the acceptance criteria, how will we assess the suitability of electronic records and electronic signatures?